University of Arkansas athletic employees are allowed to provide advice and be present during negotiations, just no lawyers or anyone acting as an agent. Mike's connections get his foot in the door with teams. Also, just by declaring your name is out there so any interested teams will contact the U of A to get in contact with Macon. It isn't just him against everyone. I don't know what to tell you other than any player who leaves for overseas without discussing and negotiating with teams are complete idiots. Some probably do, but most don't. If he gets an offer he feels is reasonable and plans on leaving, then he has an agent/lawyer look over the contract and negotiate more on his behalf, thus forfeiting his eligibility. He has a good understanding of what he can and can't get well before he reaches that point, though. If he never declares and never puts his name out there he will not know what he can or can't do, though. I don't have an issue with any of this. Declaring, negotiating, etc. I don't really even have a problem, per se, with him going pro. I mean, I get it. I just think it can be so much better for him if he comes back. I don't know what his goal is, though. I assumed based on his own comments that he actually wants to be a relevant professional basketball player and play in the NBA. Giving up a chance to get drafted next year so he can just take any old pro contract right now (which is my perception of what he'd be doing based on his perceived "stock") is what I don't like. I don't like him selling himself short, and I think he'd be doing that by going pro right now, honestly. But, like you said, he hasn't hired an agent as far as anyone knows, so one would think he hasn't fully decided to go pro. I hope he elects not to. I think whatever the highest number he has been given from a team right now will be there again next summer. I don't see his stock being lower. Might not be higher but I think he's at his professional floor right now. The concerning part is all of the "sources close to Macon" talk that indicates he's set on going pro. If you believe what's been posted by some media members, he's been set on going pro for longer than he's had his name out there as an early entrant. He may go pro, but the fact he doesn't have an agent proves to me that he is not dead set on it. If he were, like you said, it would be much easier with an agent negotiating on your behalf. The process would take less time, and he wouldn't be wasting his time going to class and working out with the team. He would be working on finding a team. And I know what your stance is and see why you feel that way, but I was just explaining what I said wasn't a reach like you explicitly said. Macon coming back, y'all rest easy. From former Mizzou players, 3 in fact, that I keep in touch with that play there. 3 is a very very small sample size. The truth is, there are a lot more horror stories that says the opposite, very very few make great money, and only some make decent, some make peanutes, and aren't even guaranteed a check that wont bounce. Not every team/league gives them free room and board and pays expenses either. And I can almost guarantee that every single player is paying taxes to someone, Governments are funny that way, and don't tend to care about sports much. Where is "there?" Because there are leagues all over the world. The 3 are whom I keep in direct contact with. But, they say the same for others that they know. So, I can only go by what these guys have said. Are there horror stories? I'm sure. But are there great successes? Absolutely. And by the way, one will go to Germany next year to play his last of his 14 years. He'll be 36, coming back to the US with a wife and 2 kids and will not have to work another day in his life. Macon should get his degree to have in his back pocket. I think he should come back because his game got better as the year progressed. I honestly think he can work his way into a second round pick. He has some things to work on that can be achieved over a summer of hard work and dedication. I don't think it's a catastrophic decision if he were to leave but not the best. If that is true, he invested well and resisted the spendthrift urge. Good for him. I hate it when athletes make a ton of money, then lose it because of poor choices, bad advice, leeches, etc. Best of luck to him. Hopefully he can be a positive influence on other professional athletes, regardless of where they end up playing. Jimmy G - A New Hope! Razorback Basketball on the rise! Looking more and more promising. But these kids can be fickle. Ryan Mallett: "I don't get nervous"
How? Considering that he is not attending classes. I doubt he is academically eligible now. Who said he's not attending classes? Another board "reported" he was. Who has the concrete proof? I'm guessing neither board does. The facts and first hand reports on these boards come At you so fast it just messes you up. Made a lot if money with no expenses. How the hell can he do that? I guarantee I make twice what the highest euro guys make. I'm 42 and still having to work full time for the next 20 years. He must have played in the NBA some to make that kind of money. This is just an ignorant post. The highest paid euro players make over $1million. You make twice that? If you truly get a good deal overseas like the ones I know did, then it does not take long to save up. Even jusy $45-50K/yr with a car and apartment paid for nets you at least $25k/yr. If Mizzouman's player made at least that for 14 years he is coming back with $350k+. My guess is if you are in your 14th year overseas, you will probably make more if you are a halfway decent American player. Returning to the subject of Macon, I see in another thread that Qualls is playing in Israel. Do we think Macon is better than Qualls? What is his likely destination if he goes overseas (which we are told a couple of posts ago won't happen anyway)? That's a great question, Qualls definitely has better athleticism and defense. Qualls also is a better scorer when he's on and quite a bit longer. Macon is a much better all around player though, and is a much more "pure" shooter. If Macon was closer to Qualls size and hops, I have no doubt he would probably be drafted this year. And there is a difference between a shooter and scorer, and you can be both if that makes sense. Seriously? There are over 35 players making over $1.2M a year in the European League, with the highest paid player making $3.4M. Come on man. the most important post in this thread. Hopefully it'll get its deserved play before long as others debate the salaries of those playing overseas. Meanwhile our team looks like it has a legit chance again now. But by all means, let's continue the European League talk. Hope this is true I don't see this post anymore on his twitter. Umm who is Nicholas Mason? He may end up being right, but I doubt he knows anything. More tweets from him...he doesn't know anything definitively. Hope he is right tho. The tweets from April 29 are irrelevant now. I'm curious why you didn't post anything of his tweets back and forth between him and Barford about 4 on 4 and 5 on 5 games to hundred? Don't want to show that he is connected? Hmmmm...you're clearly trying to pick a fight. All I did was show more of his tweets. As you can see from yesterday...even he said he doesn't know for sure. People are acting like his tweet is official news. I also said I hope he's right. I'm aware he is a radio personality as well as a friend to many current and former Hogs. To me it appeared you only picked the tweets that only supported the point you were trying to make. Especially going back to April 29th to disprove his tweet from yesterday. Instead of presenting all sides. That I have a problem with. I posted all the tweets I could find where Nick Mason commented on the subject of Macon/Barford leaving. I don't know why anyone would not want Macon back. I even said I hope Mason is correct in his tweet. My point is that even Mason said yesterday he doesn't know what he will do...only that he thinks he knows what he will do. So basically, we are still in the same boat we were before the tweet. 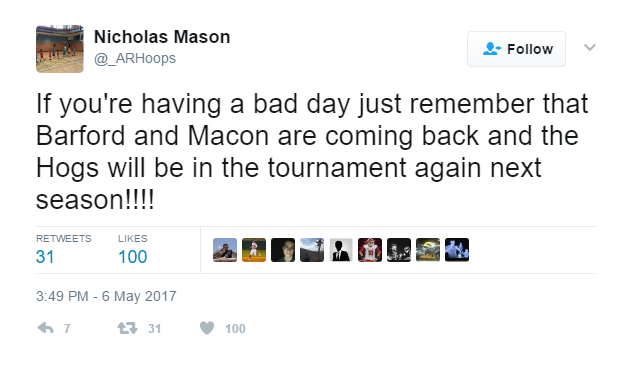 Hopefully Macon ends our suspense soon. We need both he and Barford back if we want to dance again. Its been posted on here that he was not attending class. I hope its wrong. He was going to some classes. He's taking finals. I posted that already umpteen pages back. It appears as though its you attempting to pick a fight. All he did was provide information. Some of which a lot of us have not seen. I'm appreciative of it over all the life-coach advice I've seen on this thread! Pretty much EVERY Nick Mason tweet is irrelevant. Oh.. Nick Mason. My bad. Nick Mason's tweets mean more to me than the "dumb", "uninformed", "he's making a mistake", posts I've seen on this thread. At least he has a finger on the pulse, unlike all the life coaches on here!